Why You Need to Backup Your Android? There are many reasons for why you need to back up Android, one of which maybe you lost your phone and all your precious photos was on it, or the phone’s OS was corrupted by a malware or simply you performed a hard reset on your phone forgetting your corporate data in the internal storage, this is not just the case for corporate data your personal data is also very essential, your memorable trip pictures your music albums and videos are a big deal for you. The user can accidentally delete their precious data or even factory reset the Android device without realizing the data they removed might not be retrievable, in such cases, it is no easy to get the data back, so that’s why you need to back up Android, so that in such cases you can restore your data back on to your device without any loss Unlike iPhone’s iCloud service android has no specific service to backup your data to cloud server so in the case of android the data loss risk is much higher. This article focuses on the important aspects for backing up your android device data to your PC. How to Backup Your Android with TunesGo? 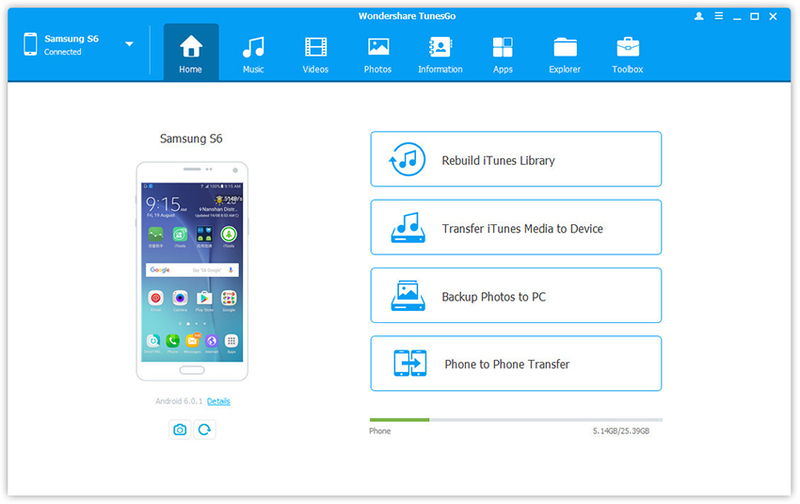 Wondershare TunesGo is one of the most effective solutions out there, this section focuses on steps for complete Android backup and restore. You need to install Wondershare TunesGo Before you can back up your Android device, After the software have been installed on your computer simply connect the handset to TunesGo, the software will recognize the device and display it in the primary window of the home tab. Now that your android device has been connected you are ready to back up your data, navigate to tool box tab of the software and click the backup device in the backup and restore tab. Right after you have selected the backup device tab in the toolbox tab you will be asked to select the type of data you want to back up you have multiple options to select simply select the types in this menu. Please Note: If you need to backup app data for your android device you need to give full permission by rooting your device. 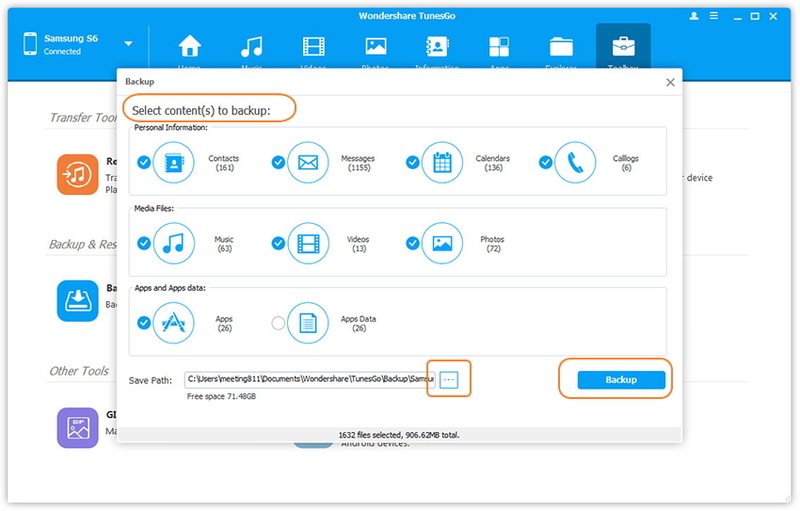 When you are done selecting content to be backed up you need to specify the path where you want your backup to be saved simply click the 3-dotted button and select the path and click on backup. After the successful completion, the backup file will be saved to the specified path. Using Wondershare TunesGo Software tool, you can Transfer your photos, music, videos, SMS, contacts between multiple devices that support same or different Operating System, for example you can transfer your data from one android device to another android device or you can transfer your android device to your iPhone device. Through Wondershare you can also transfer your android data to iTunes which is every helpful and saves a lot of time if you want to move your data to iPhone. 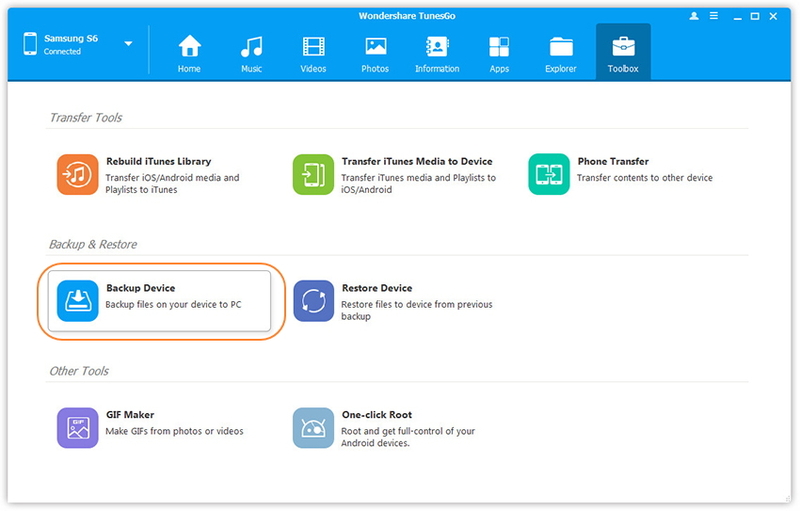 With Wondershare TunesGo you can fix the ID3 tags for iOS/Android/iPod devices. ID3 tag is a container within a Music Mp3 file. This data contains details such as Artist name, Song Name, and Year. One of the most interesting features that TunesGo provides is that you can remove duplicated music tracks in your handset with just one De-Duplication button click. With Wondershare TunesGo you can easily backup and restore your data on the handset including video email, SMS and more. The process is very simple and guided any beginner can perform the steps easily. You can also convert any picture to GIF image using Tunes Go. You cannot directly copy content to iPhone’s storage and use it as USB but you can do so using Wondershare TunesGo. Rooting your device has never been easier before TunesGo. With just one click you can root your device. TunesGo has support for rooting 7000 plus android devices. With TunesGo you can effectively backup your SMS data and restore it to any device. Not many software provides this feature.